Celebrations in Wismar: Twelve apprentices – six construction mechanics, four plant mechanics and two manufacturing mechanics – from Wismar, Rostock and Stralsund received their certificates of completion today. The young men have just completed three and a half years of vocational training. The newly-qualified skilled workers will begin the next phase of their lives as early as February 1st. MV WERFTEN offered each apprentice a permanent employment contract. There are currently 220 apprentices and 33 dual-system students studying at the shipbuilding group's three locations. 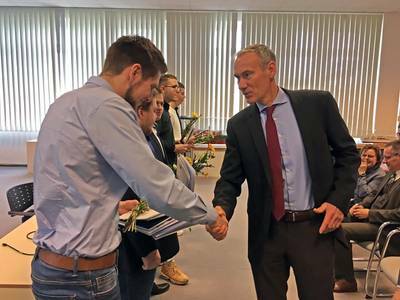 When the new training year begins on 2 September 2019, MV WERFTEN will employ 67 apprentices and six dual-system students. This will be the first year that technical product designers and industrial clerks will be trained alongside industrial, construction and manufacturing mechanics and electronics technicians for industrial engineering and logistics.